This proverb can help to find a good move. Ask yourself where you would play if you were to be your opponent. The proverb extends to tactical and strategic issues. In the top right, we see White make life for her group. Even without knowledge of eyeshapes, Black can apply the proverb as in the lower right to kill White. In life and death the key point is called the vital point. White's ideal extension is shown in the lower left. 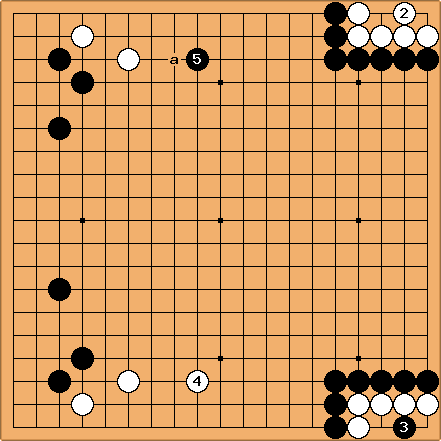 Black can apply the proverb in the upper left, though a is an even more severe play. Your move need not always be exactly the same move as he would have played. Rather, it often is a move in the same general area. Still, one can often settle the issue of who gets a key point simply by occupying it yourself. A move that is not large for your opponent is often not large for you either. Even though this kind of move might be sente, it is not necessarily worth playing out.